Aaron Kandola wrote . . . . . . . . .
Like other types of fish, cod is naturally high in protein. Specifically, 100 grams (g) of cooked cod contains around 20 g of protein. Protein is an essential part of any diet. Proteins support the “structure, function, and regulation” of cells, tissues, and organs in the body. Protein contains amino acids. It is essential to get some of these amino acids from food, as it is not possible for the body to make them itself. Many plant-based sources of protein do not contain these essential amino acids, but fish does. Cod is also a healthful source of protein. There are around 0.25 g of fat and 84 calories in 100 g of cod. Evidence suggests that obtaining protein from more healthful sources could have a range of health benefits, such as reducing the risk of diabetes and heart disease. Less healthful sources of protein are foods such as red meat and cheese. It is important to eat protein every day, as the body stores protein in a different way to other macronutrients such as carbohydrates. The National Academies of Sciences, Engineering, and Medicine advise that adults aim to include at least 0.8 g of protein per kilogram of body weight in their daily diet. The low fat content of cod mainly consists of omega-3 fatty acids. The body cannot produce omega-3 fatty acids, so people must get them from their diet. Omega-3 fatty acids are important to cell functioning and contribute to the functioning of the cardiovascular, endocrine, and immune systems. These fatty acids appear to have many health benefits, such as protecting against cardiovascular disease. Omega-3 fatty acids are less common than other fatty acids, such as omega-6. Fish, including cod, is a rich source of omega-3 fatty acids. Cod is a good source of several vitamins, including vitamins E, A, C. It is also an excellent source of multiple B vitamins, especially B-6 and B-12. Vitamins perform a range of important functions in the body, and a vitamin deficiency can have negative health consequences. For example, vitamin B-6 is important for metabolic processes and brain development. Vitamin B-12 supports nerve and blood cells. It is also important for preventing health conditions such as anemia and maintaining energy levels. Vitamin B-12 is mostly present in animal products and fish. A person can obtain other B vitamins from both plant and animal sources. Cod contains both vitamins B-6 and B-12. Cod also contains multiple minerals, including phosphorus, potassium, and selenium. Potassium supports the muscles and nervous system. Phosphorus is important for keeping bones healthy, regulating heartbeat, and maintaining kidney function. Selenium is important for thyroid function, reproduction, DNA production, and the immune system. The body needs a range of minerals to function properly. As with vitamins, it is important to obtain minerals from the diet. Consuming cod in moderate amounts is safe and generally without adverse effects. Cod, like most types of fish, contains mercury. Excessive mercury consumption can be toxic and may cause neurological and behavioral disorders. It may be particularly problematic in children. Fish naturally contain mercury, partly from consuming other fish. It may be worth limiting the consumption of large fish, such as swordfish, tilefish, and king mackerel. It is important to note that albacore tuna has significantly more mercury than canned light tuna. However, cod does not contain high amounts of mercury. So, moderate consumption of cod should not cause problems in most people. In general, cod is safe for pregnant women to consume in moderate quantities. The Food and Drug Administration (FDA) recommend that pregnant women consume 8–12 ounces (oz) of fish low in mercury. Consuming too much mercury can harm a fetus. Cod is lower in mercury than many other fish. Eating between 8 and 12 oz of cod per week should be safe for pregnant women. Other examples of very low-mercury fish are sardines and herring. There are many ways to add more cod to the diet, such as by consuming cod fillets. The best method of eating a cod fillet would be to steam, grill, or bake it. It is also possible to fry the fillet, but this is a less healthful way of cooking. Cod goes well with vegetables and in a curry. It is also possible to make cod into a pie, or to use breadcrumbs to coat the fish for added flavor. A range of ready-made products also contain cod, such as fish cakes and fish sticks. However, these products are generally less healthful. Cod is a highly nutritious food. It is a rich source of protein, omega-3 fatty acids, vitamins, and minerals. It is also low in calories and contains very small amounts of fat. It is generally safe to eat in moderate amounts. Pregnant women should consume no more than 8–12 oz of cod per week due to its mercury content. The most healthful way to eat cod is to grill or bake the fish and combine it with a side of mixed vegetables. Preheat oven to 400°F, with rack in middle. Line a large baking sheet with foil, then drizzle with 1 tablespoon oil. Pat fish dry and sprinkle both sides with a total of 3/4 teaspoon salt and 1/4 teaspoon pepper. Arrange fillets, skin sides down, in one layer in center of foil on baking sheet and slide 2 lemon slices under each fillet. Put 2 thyme sprigs on top of each fillet. Heat remaining 2 tablespoons oil in a 10-inch heavy skillet over medium-high heat until it shimmers, then saute garlic until pale golden, about 30 seconds. Add tomatoes and a pinch of salt and saute until tomatoes are softened, about 1 minute. Spoon hot tomato mixture over fish, then cover with another sheet of foil, tenting it slightly, and crimp edges together to seal. Transfer fillets with lemon slices to plates using a spatula (be careful not to tear foil underneath) and spoon tomatoes and juices over top. Serve immediately, discarding thyme before eating. Infographic: What Really Extend Lifespan? 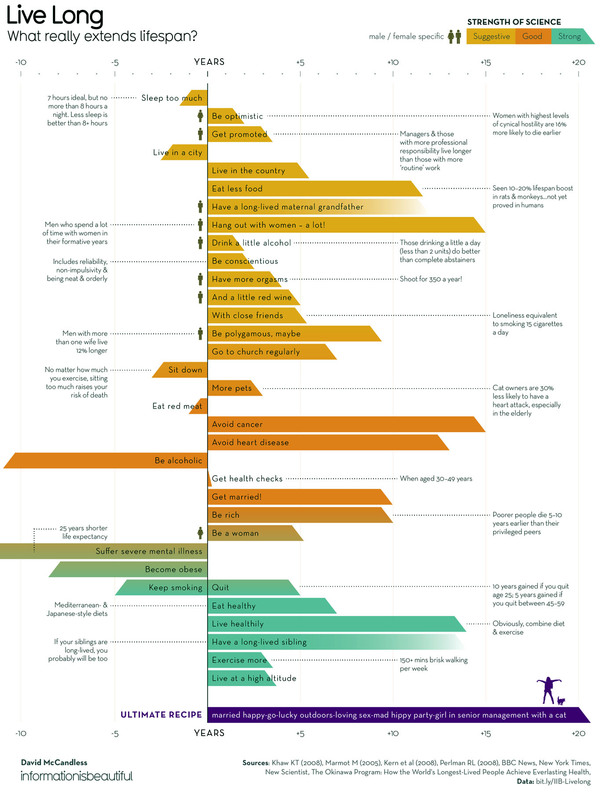 Filed under: Health, Infographic, Life | Tagged: Life Span |	Comments Off on Infographic: What Really Extend Lifespan? wrote . . . . . . . . .
A unique Rutgers-led study found that overweight and obese older women who took more than three times the recommended daily dose of vitamin D showed improvements in memory and learning – but also had slower reaction times. The researchers hypothesize that slower reaction times may increase the risk of falling among older people. The researchers, whose work is in The Journals of Gerontology: Series A, used computers to assess the impact of vitamin D on cognitive function. The researchers evaluated three groups of women between 50 and 70 years old in a randomized controlled trial. One group took the recommended daily dose of 600 international units (IU), equivalent to 15 micrograms, of vitamin D each day for a year. Another group took 2,000 IU per day and the third took 4,000. All women participated in lifestyle counseling and were encouraged to lose a modest amount of weight. The researchers found that memory and learning improved in the group that took 2,000 IU per day, but not in the group that took the higher dosage. Meanwhile, the women’s reaction time showed a trend to be slower at 2,000 IU daily and was significantly slower at the higher dosage. Shapses said 4,000 IU a day might not be a problem for younger people but for the elderly it could compromise walking or catching one’s balance to avoid a fall because their reaction time is slower. This is a presumption until future research can cover vitamin D levels, cognition and falls in one study, she added. Vitamin D – known for its importance for bone health – is obtained through sun exposure and some foods. Researchers have also found that vitamin D has a major impact on how the body, including the brain, functions. Cognitive impairment and dementia are significant public health problems, especially with aging, the study notes. Evidence shows that vitamin D plays a role in cognition and the normal functioning of the central nervous system. More than one in four adults 65 and older fall each year, according to the U.S. Centers for Disease Control and Prevention. The annual U.S. toll includes 29 million falls, 3 million emergency department visits, 800,000 hospitalizations and 28,000 deaths. Falling also leads to more than $31 billion in annual Medicare costs, and the costs will surge unless the problem is recognized and prevention is stressed. More research is needed to determine whether reaction time is related to rates of falls and injuries in at-risk populations. Examining different doses of vitamin D supplementation and from dietary sources in both men and women of different ages, and people of different races over a longer period, also needs to be studied, Shapses said. Larger studies are needed as well.